Better late than never! Europe is finally getting the massive monetary stimulus launched years ago by the United States, Britain and Japan. 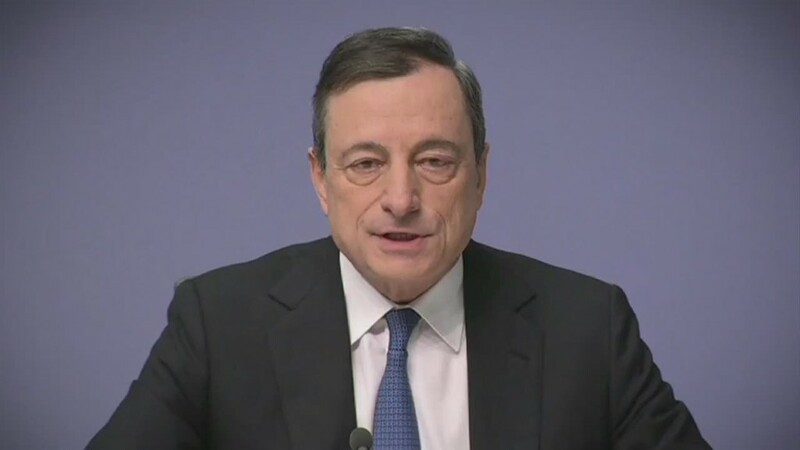 The European Central Bank started buying bonds issued by governments in the eurozone Monday, marking the beginning of a one trillion euro ($1.2 trillion) program aimed at boosting inflation and reviving the economy. The ECB, and national central banks in the eurozone, are creating new money to buy bonds at a monthly rate of 60 billion euros. The purchases are intended to continue until the end of September 2016 but could run longer if necessary to restore inflation to the ECB's target of just below 2%. The central banks are buying government bonds in the secondary market. Under EU law, they can't buy directly from the issuer. With interest rates effectively at zero, the ECB hopes that its big bazooka will push down bond yields -- which move in the opposite direction to prices. The idea is to lower borrowing costs across Europe, not just for governments but households and businesses too. 2. Will it make a difference? It already has. Bonds have surged in anticipation of the ECB's arrival in the market. Benchmark 10-year government bonds in Germany now yield just 0.3% -- that's nearly 2% less than the equivalent U.S. Treasury. Yields on five-year German bonds have even dipped into negative territory. That eases the budget pressure on governments across Europe. Ireland, which emerged from its international bailout just over a year ago, can borrow at 0.8%. The prospect of a flood of new euros has helped in other ways, too. The currency has slumped 10% against the dollar in 2015 to trade at an 11-year low of $1.09, and may be heading for parity. That has the twin benefits of making European exports cheaper on world markets, and driving up the cost of imports -- giving a kick to eurozone prices, which have been falling for three months. Cheap money is also pushing investors into stock markets in search of better returns. European markets have surged so far this year: Germany's DAX has soared nearly 11% since the ECB announced QE on January 22. By comparison, the S&P 500 has been treading water. 3. Will it help Greece? For the time being, no. The purchases are not supposed to take place for countries still receiving bailout funds from the EU. Greece's existing bailout program was just extended by four months to the end of June. The ECB could accept junk-rated Greek bonds. But it would have to be satisfied the country is meeting the terms of the bailout. It clearly isn't yet. Any participation by Athens in QE is highly unlikely before July or August, and even then it will depend on the funding arrangements Greece is able to agree with the eurozone for when its current bailout expires.